Key difference: The slim fit and straight fit jeans cause a lot of ambiguity in their buyers’ minds as they appear to be similar. However a notable difference between them is that the slim fit jeans are narrow from the hip to the ankles, whereas as the name suggests the straight fit jeans are straight. As the world started to wear jeans and love them, the jeans manufacturers seem to have pledged to make the most out of this mad obsession with the garment. So much so that one cannot even shop for a pair of jeans without experiencing a clear sense of ambiguity regarding their fitting. To add to that, an entire jargon of confusing words is served up to the consumer as a precursor to finding one pair of jeans that he/she would be happy with. For this reason, learning and understanding about these terms becomes more important. 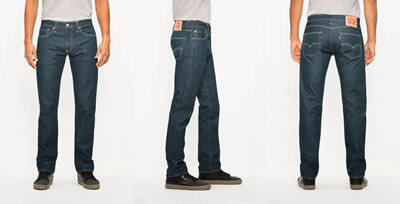 The slim fit jeans can be understood to be a pair of jeans that are somewhere between the skinny and straight types. Skinny, as the name suggests, is a tight and figure hugging variant of jeans, while straight jeans sit at the waist and are straight from the hip to the ankles, which is also the reason why they’re called as straight fit. 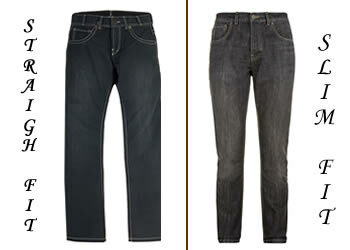 The slim fit falls somewhere between these two types of jeans. 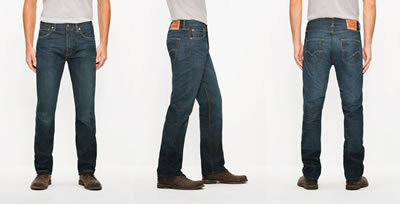 If one had to be precise, the slim fit can be called as a slightly forgiving version of the skinny jeans. The straight jeans on the other hand are inspired from the classic cut jeans, which were ‘the’ jeans in the market, until the jeans manufacturing companies started putting jeans-lovers into a tizzy. The straight jeans are also iconic in a sense, as they’re the first kind of jeans to be worn by the world, right since Levi’s introduced them back in the year 1873. Unlike other fits, straight jeans don’t taper from the knees to the ankles, and neither do they narrow at the thighs or the hips. A straight fit jeans is well complemented with a full-sleeved shirt, which shouldn’t be body hugging either. Rounding this combo off with a jacket would make for an ideal everyday outfit. People with an athletic build should opt for the slim fit jeans. The slim fit can actually accentuate their lower body structure by highlighting their muscles. The slim fit sits fairly low on the waist, so it is not recommendable to people who carry a little extra weight in their hip and thigh regions. The slim fit jeans are good to be paired with t-shirts specifically. They can go well with a V-neck t-shirt, as well as a round-neck t-shirt. This kind of apparel is replete with a pair of sneakers, as long as they’re not screaming for attention more than the jeans or the t-shirt. Therefore while investing in a pair of jeans, it is essential that one learns about his/her body type and the various options available in accordance. They fall in between the skinny and straight fit types of jeans. The iconic style of jeans, or in other words the original jeans. Awesome explanation, went shopping for men's jeans at Macy's and it was so confusing between slim and straight, to be honest they looked identical she. I held them up next to each other!